A researcher from the University of Saskatchewan is gaining attention for the development of a 3D bioprinted heart patch that could be used to re-grow and repair damaged heart tissue. The research, recently published in the journal Tissue Engineering, could be a big step forward in the study of heart disease treatment. The researcher in question, Mohammad Izadifar, is a biomedical engineering PhD student at the University of Saskatchewan in Canada, and has specialized in heart disease and heart disease treatments. His recent 3D bioprinting breakthrough has so far been tested on animals with positive results. 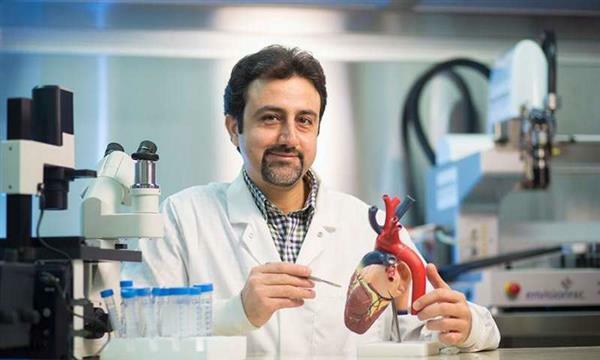 Impressively, Izadifar says his innovative 3D printed heart patch could be ready for use in humans (at least on a trial basis) within the next ten years. The goal of his research is to revolutionize treatment processes for heart disease. When a person has a heart attack, blood flow is partially or fully blocked to a certain part of the vital organ. If the person survives the attack, the damaged part of the heart still cannot be fixed. In other words, healthy tissue cannot regenerate naturally to fully recover the heart. The researcher’s heart patch, however, could provide a solution to this problem. Izadifar developed a patch which could be assembled using biocompatible materials and a 3D bioprinter. The patch, which consists of a “porous jelly-like structure” and is made from an algae-based hydrogel, is designed to dissolve into the patient’s heart after it is implanted.